Your hands are one of the first places to show your age, and the hands age faster than the rest of the body. Years of sun, chemical, and water exposure lead to brown spots and texture problems on the back of the hands. Then, as we continue to age, our hands lose volume, fat and skin elasticity. The skin thins, wrinkles and becomes more translucent, revealing the underlying structures – veins, tendons, and boney knuckles. Although changing hands are an unavoidable part of the natural aging process, a combination of treatments can restore the youthfulness that time has taken away. Effective hand rejuvenation requires restoration of lost volume and treatments to improve skin tone and texture. Photoaging can be treated with the PiQo4 picosecond laser, the PDL laser and IPL treatments that improve pigment problems and fade sun damage. Lost volume can be corrected with fat transfer, Radiesse and Sculptra filler injections. Texture can be smoothed with CO2 or erbium laser resurfacing treatments. The renowned experts at Moy, Fincher, Chipps Facial Plastics and Dermatology in Beverly Hills have multiple minimally invasive procedures to rejuvenate your hands, making them one of your best features. The hand rejuvenation specialists at Moy, Fincher, Chipps Facial Plastics and Dermatology will evaluate your needs and create a treatment plan that addresses all of your goals safely and effectively. One or a combination of fillers may be used to plump the skin, adding back volume to hide veins, and protruding tendons and bones. When the veins remain noticeable, they can be removed with sclerotherapy. The PiQo4 picosecond laser can treat sun damage and dark spots. Finally, the resurfacing CO2 and Erbium lasers may be used to improve texture and tone, and tighten and smooth the skin, giving an overall more youthful, healthier appearance. Here are some of the procedures that may be used alone or in combination to help you achieve beautifully rejuvenated hands. Radiesse is a biocompatible filler approved for use in hand rejuvenation. It is a soft tissue filler gel made of fine calcium hydroylapatite microspheres that when injected into the skin of the hands provides an instant plumping which can last up to 1-2 years. An added benefit is that it stimulates the body to make more collagen. Collagen gives the skin support and fullness. The collagen build-up can take a few weeks but will last up to 18 months. The long-lasting results of Radiesse are due to this new collagen production. The color and opacity of the product also conceal bones, veins and tendons. Sculptra is a soft tissue filler that “volumizes” more than it “fills” hollows and deflated skin. Sculptra is made up of Poly-L-Lactic Acid crystals that are biocompatible with the human body meaning that injections are safe and don’t cause allergic reactions. 4-6 weeks after injections, the Sculptra crystals stimulate collagen synthesis, an important building block that restores support and fullness. It is injected more deeply than Radiesse, and can last up to two years. Brown spots are one of the first signs of aging on the hands. 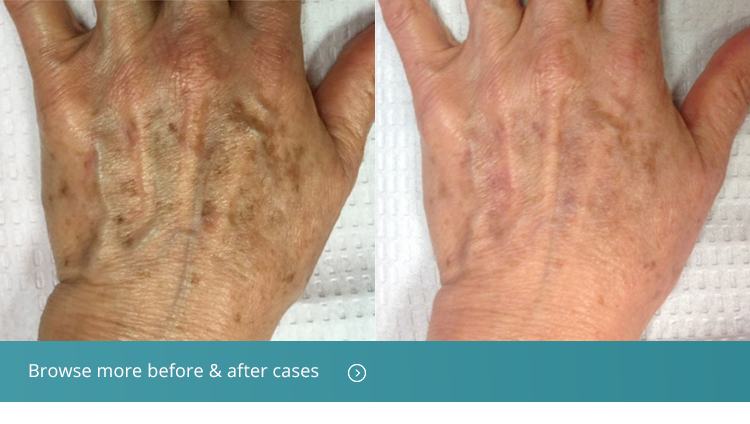 While some of these pigment changes are very close to the surface of the skin and others are much deeper, the piQo4 picosecond laser has the ability to effectively target pigment at all skin levels. This laser targets brown spots and destroys them quickly without generating significant heat. This means less downtime and faster healing for our patients. Our fractionated Erbium laser precisely reduces fine and moderately deep wrinkles on the skin. It vaporizes damaged skin, removing it, and creates micro-wounds on the skin’s surface, which helps regenerate healthier skin. Because this laser focuses on surface damage, it creates less post-treatment redness and swelling, proving a more rapid healing process. It can be used successfully and safely on darker skin tones. Our fractionated CO2 laser is stronger than the Erbium laser and is able to address more significant sun damage and age-related changes. The CO2 laser drills micro-wounds in the skin, which stimulate a healing response. As these micro-injuries heal, collagen production begins, ultimately thickening the skin. Because the CO2 laser also targets brown spots and texture problems, treatments also yield smoother, more even and healthier skin. Sclerotherapy is a safe method to permanently eliminate unwanted, prominent veins on the hands. A safe anesthetic material is injected into veins, which injures vessels from the inside out. This causes them to close down and ultimately fade away. Because the body has so many redundant veins, removing some is safe and doesn’t cause health problems. Do you have prominent veins and tendons due to a loss of volume? Is the skin on your hands wrinkly and thin? Do you have age-related brownspots? Is the texture and tone of your skin aging your hands? Hand rejuvenation can give you smoother, fuller hands with less prominent tendons, bones and veins. At Moy, Fincher, Chipps Facial Plastics and Dermatology in Beverly Hills, we can offer you hand rejuvenation that improves every skin layer so that your hands no longer give away your age. Our patients who undergo hand rejuvenation procedures are extremely happy and always recommend it to family and friends. If you wish to enhance your appearance, boost self-confidence, achieve smoother skin and a more youthful look, hand rejuvenation may be right for you. Call us at 310-274-5372 to schedule your personalized consultation.